Philip Glass for Solo Trumpet? This album came about thanks to my discovery of Philip Glass’s Melodies for Saxophone. I came across these jewels while scouring Glass’s website looking for something that I could potentially play on trumpet (whether originally composed for trumpet or something I could arrange). When I discovered that Philip Glass had written out these melodies in C and simply handed them to the saxophonist, along with the instructions to choose the saxophone that best matches the range and character of the melody, I realized that I could treat it as if he had simply handed the melodies to me and left it to me to create a version for trumpet. So that, in the end, is what I set about to do. Scroll down to learn more about the pieces on the album. The Melodies for Saxophone were originally written as incidental music for a play that was based on the novel Un Captif Amoreux (Prisoner of Love), by the French author Jean Genet. These constantly shifting modal melodies cover a wide range of emotion and experience, from touching and introspective to joyous and dancing. They are quite different from what many people envision when they think of the music of Philip Glass. These melodies provide an immersive experience, transporting listener and performer alike into their world, not unlike the solo music of J.S. Bach. Gradus begins with a simple five-note ascending motif that is quickly manipulated and developed by interjecting 8th rests and changing the order of the notes. After introducing the original 5-note set, Glass uses a kind of intuitive additive process, gradually adding notes one at a time over long stretches of music, eventually showing the complete set of 11 notes at the peak of the expansion in Part II. Immediately after the introduction of the complete set, however, the listener is hit with a 2-note motif of a major second, with four 8th notes tied together in two pairs, sounding like two quarter notes. This motif instantly spreads like a virus, sucking the moving 8th notes into itself, growing in rhythmic length as the set of notes instantly retracts. Eventually the motif itself is reduced to one single repeated note, sounding incessantly in the same rhythmic blocks we have heard throughout the piece, melody reduced to rhythm. Listening to this music may require a change of perspective in the listener, as there isn’t any harmony or true melody in the traditional sense. Instead, what we have is a constantly evolving rhythmic and motivic flow, with many different characters brought out by the constant shifting of notes and rhythms. Imagine something like a black and white kaleidoscope that gradually unveils more shades of grey in constantly shifting patterns as you turn it, eventually giving way to twisting intricate shapes of whiteness. 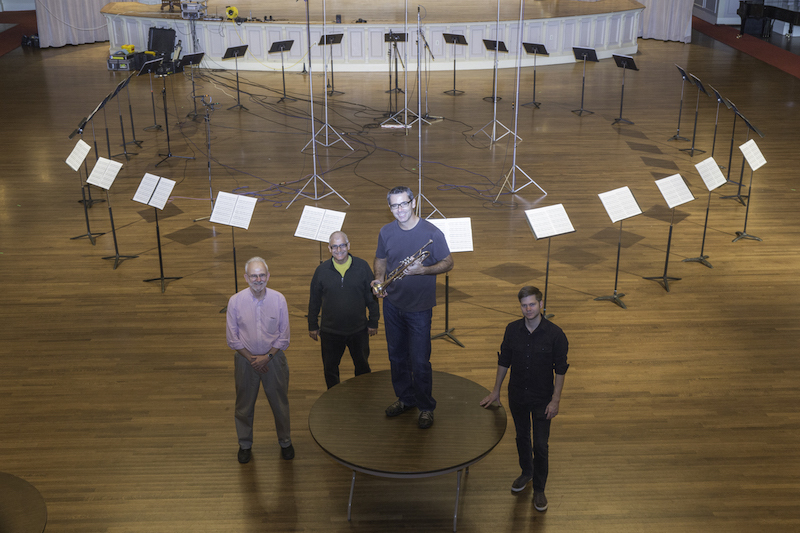 Piece in the Shape of a Square was written for two instrumentalists (flutists to be precise), where the sheet music was laid out in a roughly 10’ square with the performers moving around the square as they read the music. For this recording I performed both parts and overdubbed them, creating a completely unified soundscape that works well in this rhythmically intricate piece. Since we recorded in Hi-Resolution Surround Sound (a version available for download on sites like HIGHRESAUDIO), we had to lay the stands out in a big “square” around the surround sound microphones. This allows the listener to "sit in the middle of the square and have the music evolve around them. We couldn’t set them up in an actual square, though, because then the recording would get softer at the corners; thus they are setup in a large circle around the surround sound microphone cluster. With its catchy motives and driving pulse, the overwhelming takeaway to me for Music in the Shape of a Square is really that of a giant dance. One could easily put a big thumping kick drum behind much of the piece and imagine it being played at a dance club.